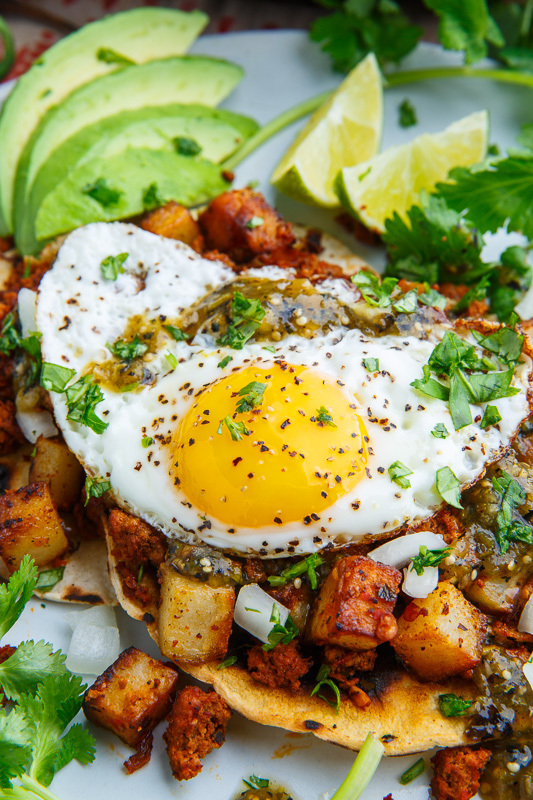 Fried chorizo and potatoes served on crispy tortillas and topped with salsa verde and fried eggs! 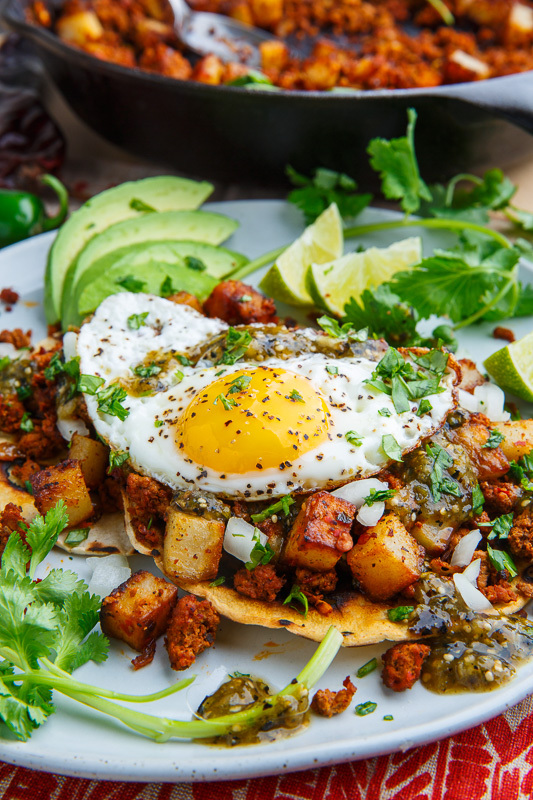 Crispy fried chorizo and potatoes are a great meal all by themselves but why not kick them up a bit by topping them with a fried egg with a runny yolk in addition to some tasty salsa verde and serving it all tostada style on crispy tortillas? Yum! These tostadas are so easy to make! 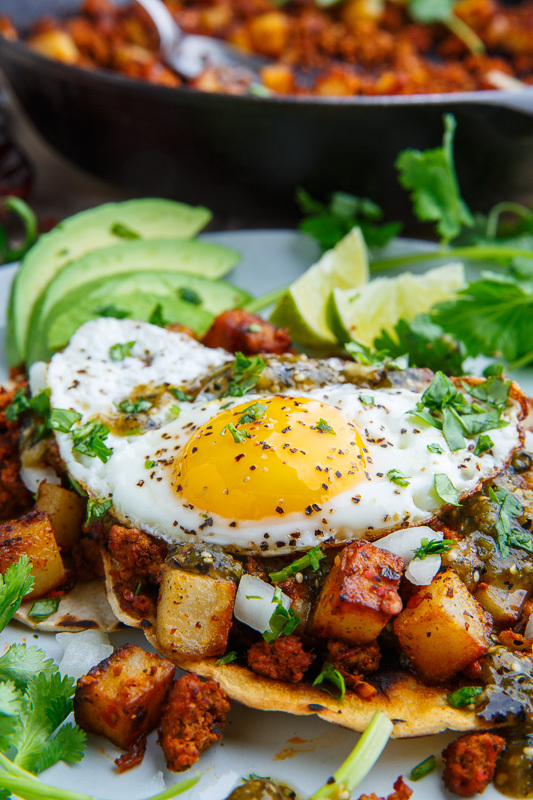 You fry the tortillas in oil until crispy, fry the sausage and potatoes and the eggs before throwing everything together! 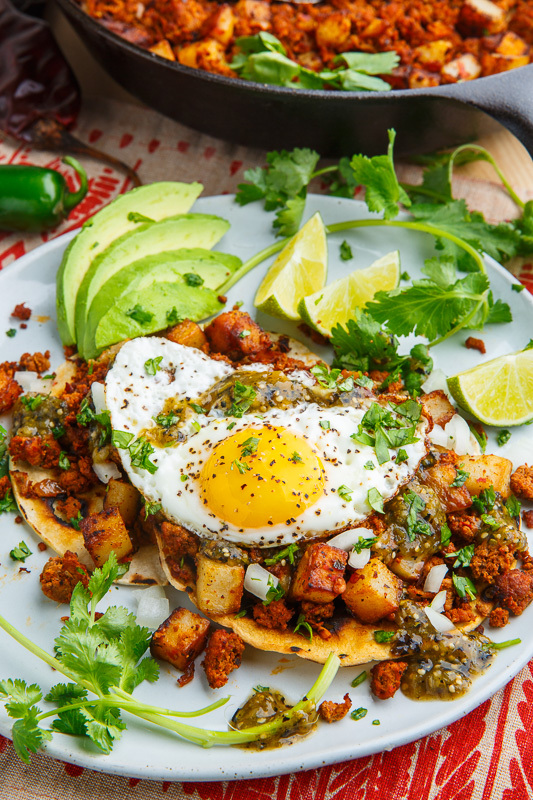 Heat the oil in a pan over medium-high heat add the tortillas, one at a time, and fry until lightly golden brown and crispy on both sides, before setting aside on paper towels. Add the chorizo and onion and cook until the chorizo turns lightly brown and gets all nice and crispy on the edges, about 6-10 minutes, before setting aside. Crack the eggs into the pan and fry as desired. Assemble the tostadas and enjoy! Option: Top with your favourite taco style toppings! Looks delicious! I'd like to make it this weekend but need a little clarification: Chorizo is fairly greasy. Did you drain the grease from the cooked meat before adding it to the potatoes? And, how many total pans did you use? I don't relish the idea of cleaning 3 pans so was hoping you did this in 2! Thanks Kevin. Karen vG: I usually use 1 pan and cook everything in it. If there is a lot of grease after cooking the sausage you can drain all of it except what you need to cook the potatoes. Enjoy!